During her stay in Philadelphia in 1786-87 ANN HEAD WARDER described in her diary a sight that didn’t seem to disturb her very much. 3 mo. 30th. —The convicts here have recently been condemned to hard labor instead of execution, and now clean the streets. They have an iron collar around their neck and waist to which a long chain is fashioned and at the end a heavy ball. As they proceed with their work this is taken up and thrown before them. Their clothing is a mixture of dark blue and brown stuff; their heads shaved; they wear parti colored woolen caps, so that an attempt to escape would early be discovered. A guard accompanies each gang. At first the prisoners were much averse to this shameful exposure, and preferred death to it. Two things I think need regulating, suffering people to talk to them, and to prevent their receiving money. As the states began to limit the number of crimes that warranted the death penalty they were faced with an increase in convicted criminals. Confining them in jails where they would often work at hard labor was one option. There was another: an experiment in Pennsylvania that involved both shaming and hard labor which were thought to be reformative. The Wheelbarrow Law was enacted in 1786; it required convicts to labor in the streets during the day, just as described by Ann Warder, and be housed in jails at night. Although the law was copied by other states it was soon deemed a failure. Fights broke out among the convicts and/or with the public; passersby jeered or cheered them. In 1790, an addition to the Walnut Street Jail in Philadelphia was built based on a concept put forward by Quakers. Prisoners were housed in individual cells—formerly they had lived together in large rooms—where, in basically solitary confinement, they were expected to reflect on their crimes and repent. 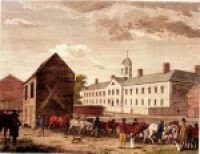 It was the first state penitentiary (from the Latin, meaning remorse or penitence) in the country, shown in the illustration in 1800. “Extracts from the Diary of Mrs. Ann Warder,” 61, The Pennsylvania Magazine of History and Biography, Vol. XVII, 1893, No. 1. For information about the Philadelphia treatment of convicts see Wheelbarrow Law. For information about the “reform” in Pennsylvania’s prison system see HERE. The illustration can be found HERE. Outside the window next to my computer I see that snow is falling, along with the temperatures, yet again. Fie on the polar vortex. Yet it puts me in mind of Valley Forge and the suffering of the Americans there in the cold winter of 1777-78. And of other examples of severe winter weather described by women, some in our book and others I have since come upon. It seems appropriate to present a few. In 1777, Frederika von Riedesel, with their three children, had joined her husband in Canada where he commanded the German mercenaries hired by the British. General von Riedesel pushed south into New York with British General John Burgoyne and his troops in an attempt to cut off New England from the other colonies. Frederika, who was with him, witnessed the decisive defeat of their combined forces by the Americans at Saratoga on October 17, 1777. The British and Hessian troops were marched to Boston, where the Von Riedesels were put up in a house in Cambridge. In the following year as winter approached, Congress decided to move the prisoners to Virginia where their maintenance would be less costly. The Baroness and her children traveled by carriage while her husband made the journey with his troops. Frederika described what the family had to contend with.
. . . The place of our destination was Colle in Virginia, where my husband, who had gone ahead with our troops, awaited us with impatient longing. We arrived here about the middle of February, 1779, having, on our journey, passed through the provinces of Connecticut, New York, New Jersey, Pennsylvania and Maryland, and having traveled in twelve weeks, six hundred and seventy-eight English miles. . . . The passages from the Baroness’s journal appear on pages 268-69 of In the Words of Women. Not one soft slumber cheats this vital pain. I make each sigh, each mortal pang my own. But why should I implore sleep’s friendly aid? And rack with fears my sad prophetick heart. That e’er I knew the tender name of wife. Oh! could I take the fate to him assign’d! And leave the helpless family their head! I’d quit the nurse’s station for the bed. This excerpt is from In the Words of Women, Chapter 7, page 201. For information about Morven, click here.